I'm getting an increase in e-mails from the nursing community. It seems that the mix between proper care / documentation of cases and the need to protect against liability has lead many nurses to pack a small point and shoot camera as part of their kit. They are using these cameras to document wounds, bruises, bite marks, odd rashes, and so forth as part of the patient's file. Patients, especially children, are often in so much pain that keeping them still becomes a problem and the nurses just have to point and shoot and hope for the best. More and more of them are turning to Photoshop to help fix the photos. Bruising can be tough to shoot. The subtle differences in shading are not always detectable. Thankfully, the Forensic Photoshop workflow was made for this problem. The image above needs correction in terms of focus and global / local light and colour. In just a few simple steps, we move from an out of focus, hazy picture to one that clearly shows the bite mark and resulting bruising. The wound is now captured in time. 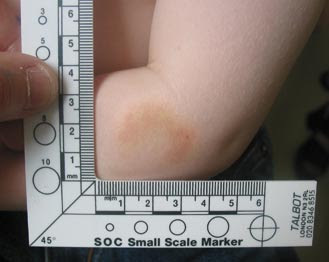 Were this an odd rash or something rarely seen, as happens in rural urgent care situations, this clarified picture could be e-mailed along with the nurses notes to a specialist for a consultation - thereby extending the reach of the specialist and maximising the treatment options for the patient. The differences in the before and after may be subtle, but colour and shading can make all the difference when a doctor is trying to diagnose a patient over a long distance. In cases where the hospital staff is injured by a patient, it can be a vital part of the documentation for a worker's comp case. The uses for the Forensic Photoshop workflow are endless. Medical professionals who are interested in learning more about the power of Photoshop and how to leverage this power in your workplace can find more information by clicking here. The American Institute of Forensic Education is the new host for my self-paced on-line class. Now you can learn to apply the workflow in the comfort of your own office and at your own pace. Hi. I have a question on something like this - may be slightly off topic. What would one be best off doing in the following situation? There's a photograph that is to be used for forensic or enhancement purposes, but the photograph was taken at an odd angle. It makes it very hard to read. To make it easy to interperate or to just see the lettering and characters, the photograph needs to be rotated something like 30 or 45 degrees, but of course, rotation is going to cause some pixel distortion. I figured I might be okay if I just blow up the image to a larger size using nearest neighbor and then put it on a larger canvas and rotated it, because that seems like it would give enough space to not lose quality. However, I'm not entirely sure if this is the best way.